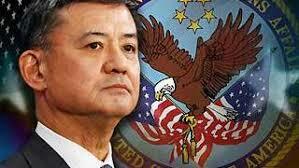 On Friday, President Obama announced and had accepted Director of Veteran Affairs Secretary Eric Shinseki resignation. Shinseki would be taking the fall for the scandal which has engulfed the VA, but to many this was long overdue especially when members of both parties have called for his resignation. The president continued to praise Shinseki for his years of honorable service to his country as a soldier, and as a member of his administration. With the resignation of Shinseki, the president has named Sloan Gibson as acting VA director until a permanent replacement is found. Gibson previously served as Deputy Secretary of Veterans Affairs, and President of the United Service Organizations (USO). Gibson has also served his country in the U.S. military, having graduated from the West Point Military Academy. On Wednesday, the VA’s inspector general released a preliminary report and found “systemic” problems the Phoenix Veterans facilities, confirming the reports of gross mismanagement regarding misconduct and lengthy wait times, first reported last month. Shinseki had faced a withering barrage of criticism since the scandal first broke, and when the IG presented its findings of systematic abuses and gross mismanagement the call grew louder for his resignation. The call for his resignations began growing with the release of the IG’s report, with 12 Senate Democrats calling for Shinseki to step down. Various veterans’ organizations reacted to Shinseki’s resignation with the Veterans of Foreign Wars (VFW) stating an “American patriot” whose commitment to veterans is “above reproach,” but said his resignation was in the best interests of the nation’s veterans. Iraq and Afghanistan Veterans of America issued a press statement, signaling deep systematic failure at the VA, which goes far beyond the resignation of Shinseki. The resignation of Shinseki, doesn’t end the bureaucratic mess which all veterans know firsthand of. As someone who has served in both Iraq and Afghanistan I know all too well the chaotic dysfunction associated at the Veterans Affairs. Both political parties now have the chance to now overhaul Veterans Affairs. Now is not the time to score political points or in some cases, with members of Congress have now becoming outraged over this scandal as this might hurt them in the 2014 mid-term elections. It’s time to finally give the Veterans Affairs a much needed overhaul with a true bi-partisan investigation, independent of any government agency or political party. Veterans gave all for this country now it’s the nation’s turn to serve them.